Named after 15th Century made jugs used to carry wine from oak cask to table, the labels show etchings taken from Bellarmine jugs. Bellarmine Wines is a couple’s dream come true. They’d like to share their dream with you. Dr Di Miller has been making wine since 1999. 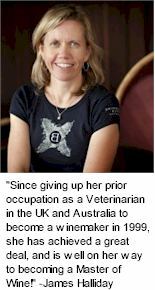 Before this she enjoyed working in mixed and small animal practice as a veterinarian in the U.K. and Australia. Di is passionate about wine and about her work for Bellarmine which she sees as a very high quality vineyard that produces restrained, savoury wines full of flavour and balance. “Each year the wines get better and better”, enthuses Di, who has made the wines for Bellarmine since they began production in 2004. Di also manages the Bellarmine wine company which she has done since July 2008. Prior to this she was Senior Winemaker and Manager of the highly successful contract winery, The Vintage Wineworx in Porongurup, Great Southern. In 2007, Di was a State finalist in the Telstra Businesswoman of the Year Awards. Now in her second year of the Master of Wine course run by the London Institute of Masters of Wine, Di has enjoyed the opportunity to travel to Bordeaux, Burgundy, Champagne, and the Rhone Valley in France and Ribera Del Duero, Rioja, Jerez, and Madrid in Spain.